“Our credo is that the mutual goals of the citizens and the state are the good life, safety, order, justice and the fulfilment of freedom. We believe that people’s power exists only if the state serves its citizens and arrange their matters fairly and free of any mistreatment or bias.” – states the National Credo of the Hungarian Constitution. Pursuant to the Constitution the operation of the Hungarian state is based on the principal of the distribution of powers: the task of the dispensation of justice belongs to the courts. Courts render decisions in criminal and civil law cases, on the legality of public administration decisions, on the collision of local government decrees and other laws that are ranked higher in the legal instrument hierarchy and on their annulment, on the establishment of the failure of local government to pass decrees when they are required by law to do so and in other cases prescribed by law. The judicial organization is one of the basic pillars of the Hungarian rule of law. 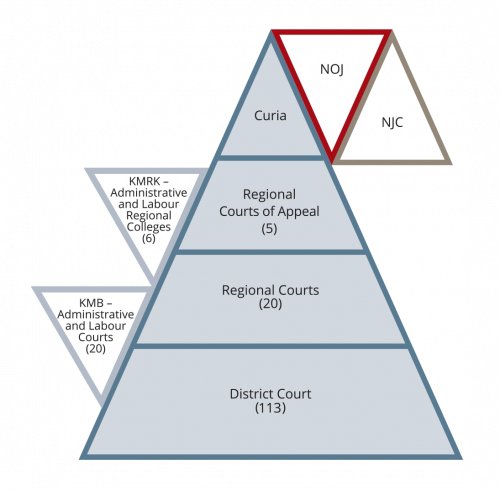 Currently there are 158 courts in a four-tier hierarchy: district courts, administrative and labour courts, regional courts, regional courts of appeal and the Curia. The different court levels are closely interconnected but there is no subordination between the respective levels: the courts situated higher in the hierarchy do not have any right to give instructions. Judges are independent and shall not obey any instructions concerning their adjudication activities and they render their decisions pursuant the applicable laws and their own belief. The main judicial body is the Curia that ensures the consistent dispensation of justice and renders decisions for the sake of consistent dispensation of justice that are binding for the courts. 11,000 people work in ’s court system, the number of judges barely falls short of 3,000. This headcount has been basically unchanged since 2011, contrarily to the significantly increased workload that awaits its completion.